So about a month ago…….haha. Yes I should’ve written this the day after it occurred, but I was more focused on finishing my Portuguese course and moving to Fortaleza (different blog post soon, and I promise very soon, to follow). On Wednesday, February 1, we had our final written exam, for which I was a good student and actually put quite a few hours into studying. The test wasn’t that bad, but I did think it was more difficult than our first exam (mainly because my teachers didn’t give me the opportunity to create an exciting adventurous story). Our huge oral exam was the next day. Did we study for it? Nope! We figured that if we don’t the language well enough to speak with some fluency then one night of scrambled practice wasn’t going to do us much good. 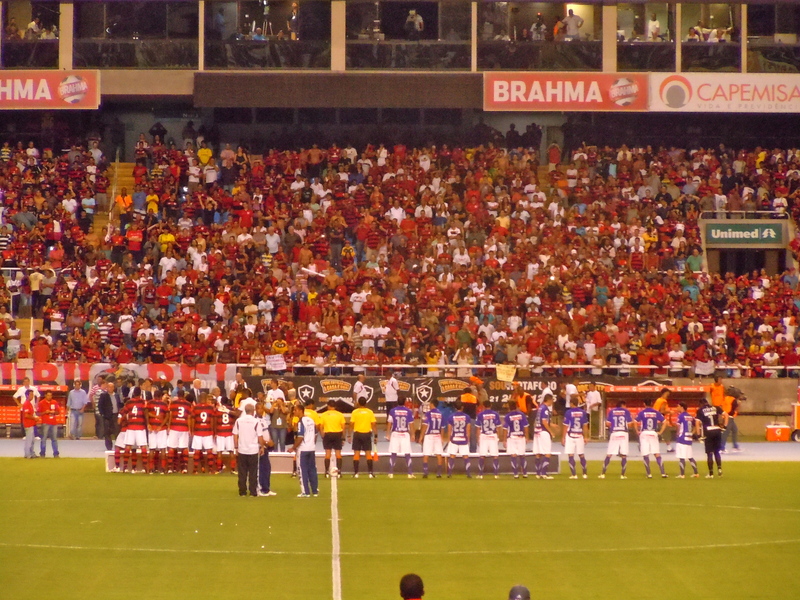 So we bought tickets to a REAL football game: Flamengo vs. Real Potosí. The game was the second leg of these two teams meeting in the Copa Libertadores. This past fall semester I started following international football a bit more closely than I had prior to finding out I was about to spend six months in Brazil. It seemed appropriate. As a result, I am now absolutely obsessed with football, hands down. 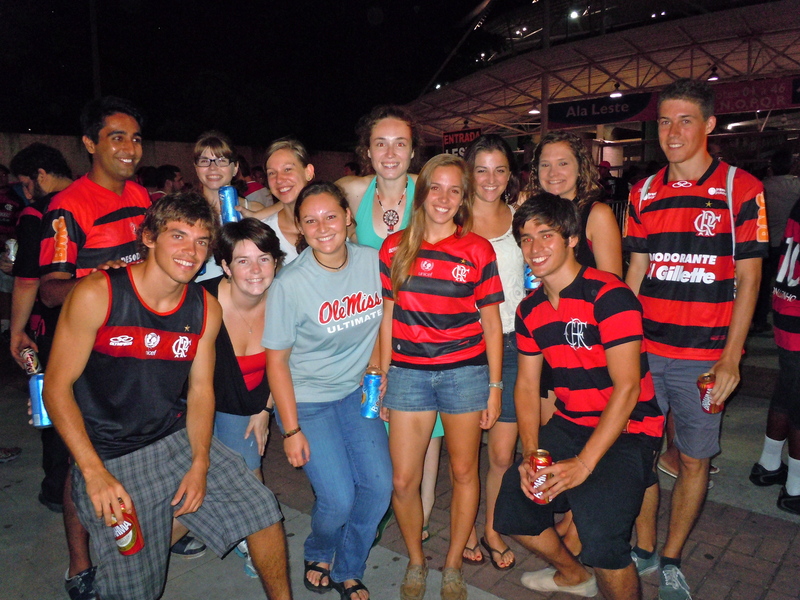 Going to the Flamengo game was a whole new experience and I’m sold for life as a football fan. The total number of people in the stadium was over 36,000. That’s more than live in Oxford, Mississippi. And that was a small, rather insignificant game… I can’t even image what it would be like to attend a rivalry game with 90,000 fans! 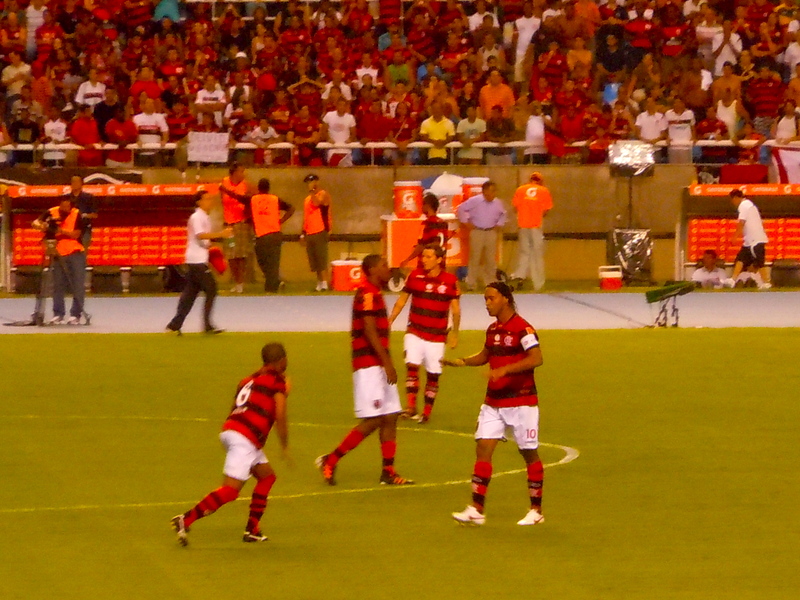 Flamengo won the game 2-0 which advanced them to the next round of the Copa Libertadores. Needless to say, the fans were pleased. When the refs walked off the pitch, I saw guys in the stand trying to hand them money and cheering for the men they had booed 2 hours earlier. Ridiculous but hilarious. 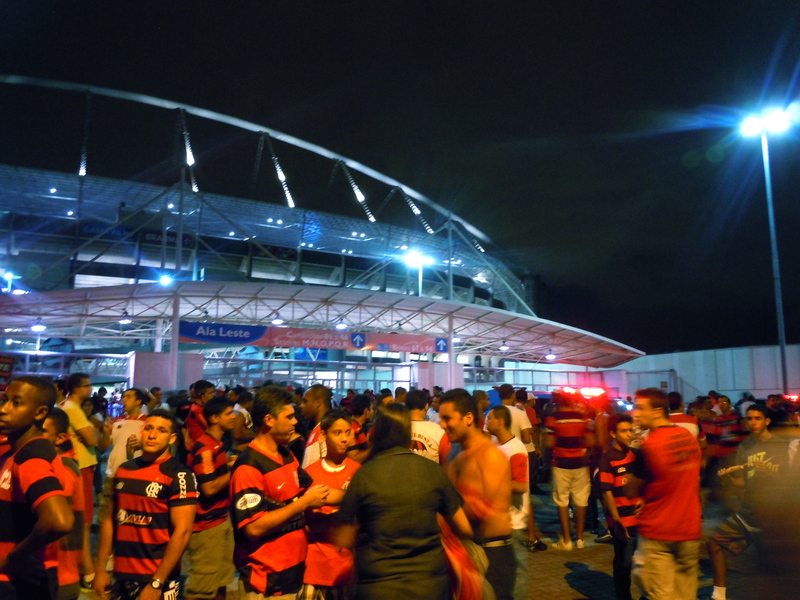 The fans poured out of the Engenhão still singing and dancing. It really was one of the best experiences I had in Rio. It would take a massive sporting event in the States to rival the mood and energy generated by that small encounter between the Brazilians and Bolivians. I can’t wait to go to another game! Hopefully, in two years, I’ll be able to come back to Rio and experience a 90,000+ crowd in the completed Maracanã for the 2014 World Cup! ~ by dfsg1991 on February 28, 2012. Eu acabei de perceber que é vocé! Sinto sua falta muito! Como foram suas aulas? Lara e eu completamos nossa primeira semana das aulas aqui em UFC e elas são muito legal! Não há muitos estudantes do intercambio aqui, mas é melhor porque temos que falar em português o todo tempo. Abraços!